This leaf and bezel eternity band can be made in platinum or any colour gold with diamonds, coloured diamonds, blue sapphires or coloured sapphires. You can order it online in 14K gold with white diamonds. The milgrain (little bumps) you see around the leaves is optional. For other options, please contact us by phone or by email. 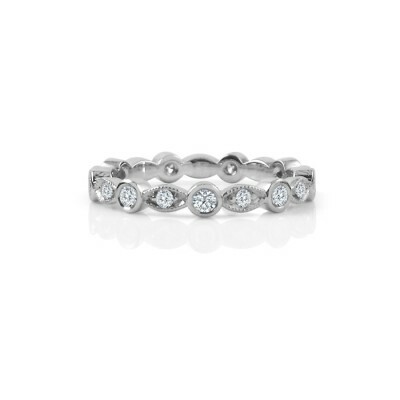 It makes a great wedding ring or stacking ring!